If there's one thing to hate about Android, it's the uncertainty about whether your phone will ever run the latest and greatest version of Google's mobile OS. Besides delivering new features, these updated versions of Android also bring security patches and bug fixes that can solve major problems in performance, call quality, and even battery life. Since Android updates vary depending on mobile service carrier and phone model, we've put together a chart to help you keep track of which phones will (or won't) be updated to the next major version of Android. To check for your phone's status on the chart, see "Android Phone Updates: A Comprehensive Guide." The list focuses on phones now available and phones confirmed to be moving up to the next major version of the OS (currently, Android 4.0, code-named Ice Cream Sandwich). Android 4.0 is a huge step forward for the Android OS, and the update significantly changes how Android looks and feels. It includes updated versions of all of the core apps, such as Gmail and Maps, and the OS looks much slicker as well. We'll update the chart regularly, so we invite you to check in periodically to see whether your phone will be getting a taste of Ice Cream Sandwich or any of the future dessert-nicknamed updates such as Android Jelly Bean. That accounts for the specific information in the chart--but what does the overall data tell us about how successful different carriers and phone manufacturers are at updating their phones with newer versions of Android? The data in our comprehensive chart indicates several trends. AT&T and Verizon currently have the largest number of phones that either run Android Ice Cream Sandwich now or are scheduled to receive it (nine models each); next in line come Sprint (seven models) and Verizon (five). 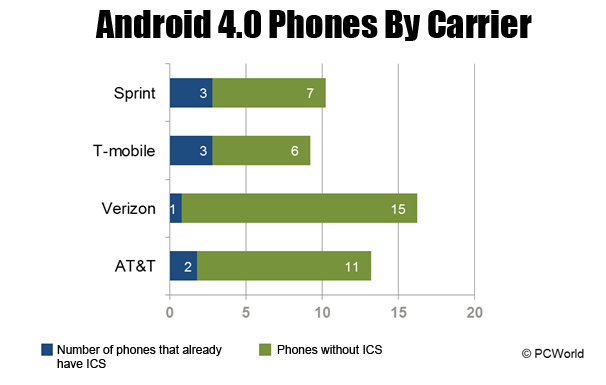 If we look at how many phones are already on Ice Cream Sandwich, however, the rankings get shuffled quite a bit, with Sprint and T-Mobile tied at the top, and AT&T and Verizon playing catch-up. 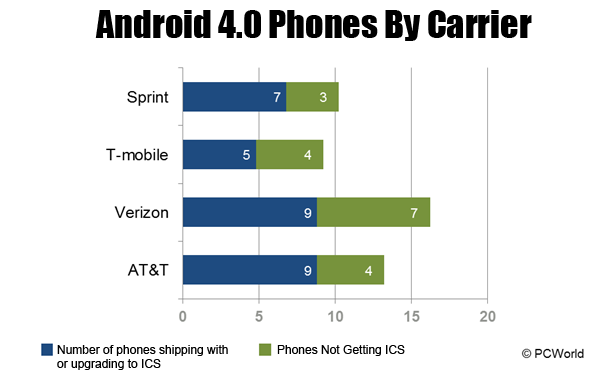 In fact, T-Mobile, the carrier that had the lowest percentage of expected Ice Cream Sandwich-friendly phones in the first chart turns out to have the highest percentage of phones running Android 4.0 now. Sprint follows close behind T-Mobile on this measure, with AT&T coming in a distant third and Verizon an even more distant fourth. Most of Verizon's lineup is scheduled for updating, but at the moment only one of its phones runs Ice Cream Sandwich. The data for updates by manufacturer is striking, too. First, let's look at the numbers for the top five Android phone makers, based on existing or planned upgrades to Android 4.0. HTC has been good about promising updates, and 80 percent of HTC devices now available either have Ice Cream Sandwich or are slated to get it sometime this year. Both Motorola and Samsung have issued timelines for future Android 4.0 updates; for various reasons, however, a few of these manufacturers' current Android phones won't be updated. For instance, though Sony initially promised to update its entire line of 2011 Xperia phones to Android 4.0, the company subsequently announced that the Xperia Play and the Xperia Play 4G (on Verizon and AT&T, respectively) would not be receive that update. Likewise, Motorola's Droid 3 will never run anything higher than Android 2.3--even though the phone came out a little less than a year ago. You may have noticed that the carrier data lists 30 existing or planned Android 4.0 phones while the manufacturer data lists 33 such phones. That's because Samsung's total includes three unlocked Ice Cream Sandwich models: the Galaxy Nexus, the Galaxy S II, and the Nexus S.
When we look at which manufacturers already have phones running Ice Cream Sandwich, we see little shifting in overall position. 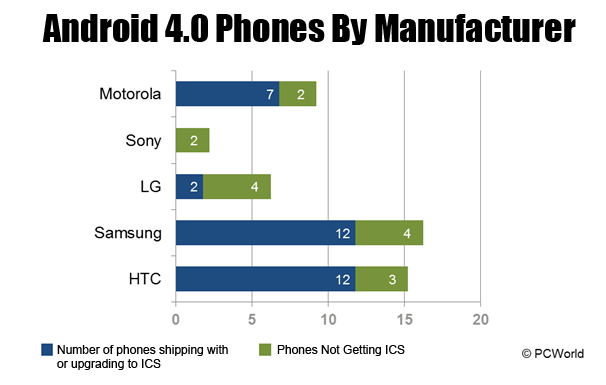 Of the five major manufacturers of Android handsets, only two currently ship phones that run any version of the operating system higher than Android 2.3. 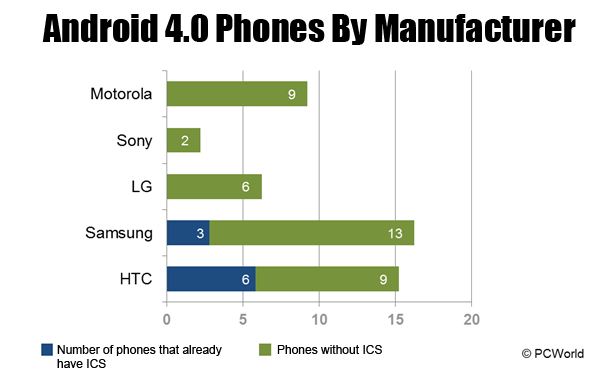 HTC has the largest number of phones currently running Ice Cream Sandwich; some of them shipped already running the OS, and others have been upgraded from Android 2.3. Samsung has three phones already on Android 4.0, but all of them are Nexus devices; the company's Galaxy S II line hasn't been updated since the phones launched back in the second half of 2011. Motorola, like Sony, promised that most of its 2011 line of phones would receive Android 4.0 updates--but we've yet to see Ice Cream Sandwich running on any Motorola phone. With Motorola Mobility now part of Google, we hope that those updates will arrive sooner rather than later. HTC currently has the best track record for keeping its phones up-to-date. To strengthen the future likelihood that your Android phone will have the latest version of Android, according to our research, your best bet is to pick up an HTC phone on either T-Mobile or Sprint. If neither of those carriers is available in your area, or if you're looking for LTE/4G speeds, buying an HTC phone on AT&T is your next-best option. Though Verizon offers a lot of Android phones, most of the updates that the carrier has promised remain simply promises. That's not to say that the phones Verizon offers are bad. But you may have to wait a bit longer for updates to reach your Android phone.